Pannell Discussions » 209 – The economics of the music industry » Ideas in economics, environment, policy and more. In my early 20s I was in a rock band, The Bargains, playing the hotels of Perth. 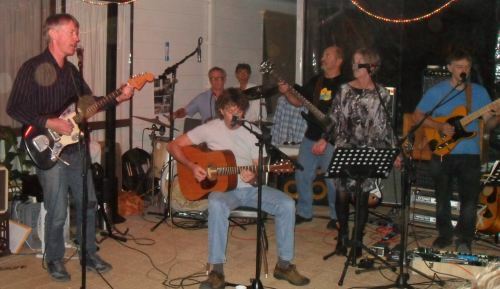 We got to be reasonably successful within the limited confines of the Perth original music scene at that time, playing about 150 shows and supporting some pretty prominent touring acts. On Saturday night, I re-lived those fun days with a one-off reunion of the band, most of whom I hadn’t seen for 30 years. It was just fantastic. With not much rehearsal, we were able to pick up the old songs and put on a really satisfying show to a highly appreciative audience, some of whom had seen us play way back when. The event was organised to mark the 10th anniversary of the death of one of our members, Dave Rose, who was a great singer and songwriter. You can imagine that it was pretty emotionally intense at times, but it was also joyous to see old friends and perform together again. Back in 1980-81, I wasn’t an economist, but I certainly got some experience of the economics of the music industry. Like other areas of the arts, it can be really tough. A tiny, tiny percentage of performers become hugely rich, but for many who don’t make it into that elite level, financial security is a struggle. It’s not too hard to explain this – it’s largely a matter of supply and demand. There are many highly talented musicians trying to make a living from their music, so it’s a buyers’ market. Musicians have to compete with each other for a share of the market, and so the prices of music services are bid down. In another industry, like say plumbing, if incomes were that low, many plumbers would quit and do something else, allowing the incomes of plumbers who remained in the industry to rise. Music is different. Many musicians can’t bear to face the prospect of giving up their music career. They are totally passionate about it, and are prepared to put up with poverty if that’s what it takes to keep playing, at least for a while. For myself, it was a huge wrench when I gave up performing in order to complete my degree. There are also some who stay in music in the hope of hitting it big and getting rich, although that’s only a minority, I think. For most, it’s their passion for music that keeps them going. Clearly, music consumers benefit from this. In economist speak, the supply of musicians is high and the price elasticity of supply is low (i.e., even if you don’t pay them much, they’ll keep playing). These are both circumstances that favour music consumers rather than musicians. Another factor that helps to keep most musicians poor is the highly skewed demand for music. Most music consumers mainly purchase music media or concert tickets for very well known acts, who are the tip of the music industry iceberg. While this is understandable, it means that the huge number of less well-known acts are competing for a small share of a small proportion of the total income generated by the industry. Musicians also cop it in the markets for inputs that they must purchase to undertake their work. My band used to spend an obscene share of our modest earnings to pay for the sound equipment (and someone to operate it) that we had to hire for each show. Good musical instruments, amplifiers, sound effects and so on are expensive, but they simply have to be purchased. In fact, many musicians end up buying many more instruments and much more equipment than they really need, because it’s their passion. The result is that people in the industries that provide services and equipment to musicians do pretty well, even though most of their musician clients and customers are not well off. In economist speak again, the demand by musicians for services and equipment is price inelastic, meaning that they’ll keep buying them even if the prices rise – clearly a situation that favours suppliers over musicians. Of course, there are other relevant factors as well, like the monopsony power of large music companies when negotiating with musicians (there are many sellers, but only one or two buyers, so the buyers are favoured), some unscrupulous business people in the industry, the naivety of many young musicians when it comes to business, the culture within musical circles that values originality and artistic integrity over commercial success, the faddish nature of musical trends, and the hedonistic lifestyles of some musicians. Overall, the poor economic conditions faced by many musicians are not at all hard to explain. But enough of that … back to the music. Maybe you’d like to hear some. I haven’t yet got a copy of the recording of our reunion performance, but I do have studio versions of three of the songs we played (Hungry, Cunning Brew and On The Seventh Day), which are available for downloading from my page of home recordings, here. Posted on 5 March, 2012 by David Pannell. This entry was posted in Economics, Latest, Music. That I’m gonna do it anyway, even if it doesn’t pay. A very relevant discussion after watching Boytown on telly last night. Dave, maybe your band should start writing for middle-aged Mums, songs about “Picking the kids up from school” etc. Although it sounds like you band is a hit anyway. Oh, how I wish I’d been in Perth to see this performance by the Bargains! What a wonderful thing to do. Interesting how the economics of the music industry parallel the economics of the literary arts. Though I have to say I haven’t spent a cent on amplifiers. Were you talking about musicians or wool producers in the 1990s? Good point. I guess this highlights that whenever you have an industry with lots of people who are either passionate about their work, or are structurally constrained to continue in the industry, there is a risk that their incomes will be squeezed.